Monte Mario is Rome's highest hill and often called the "balcony of Rome" along with the neighboring Janiculum and Vatican hills, because they overlook much of it. 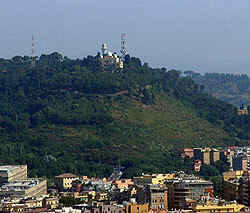 The Astronomical Observatory of Rome is located on Monte Mario. However, it is not one of the Seven Hills that are the historic and geographical heart of the city. Relatively isolated, Monte Mario was nevertheless the site of recent urbanisation. Located in northwestern Rome, Balduina is a middle-class neighborhood with four to five-story apartment buildings dating back to the 1950s. Most of the apartments have balconies or terraces, and garage parking is available. There are good local shops and supermarkets here plus a couple of hospitals and the Steiner School. The traffic is not too bad except on the main roads. To get to the main parts of the city, you can go to Prati by bus and take the underground from there.